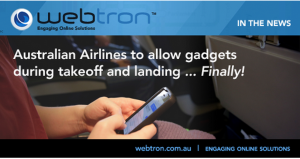 Australian Airlines to allow inflight gadgets during takeoff and landing … Finally! Airline passengers in Australia will no longer be forced to turn off their phones and tablets on flights, finally catching up to the rest of the world. The latest update from the Civil Aviation Safety Authority (CASA), released on Friday now allows airlines to apply for permission for passengers use personal electronic devices in flights, following relaxed rules already in place in the United States, Europe, and New Zealand. Devices will need to be inflight mode throughout the flight. Laptops might be out of luck due to their weight – devices more than one kilogram will still need to be stowed for take-off and landing. Smaller laptops’ stowage will be at the discretion of the flight crew. 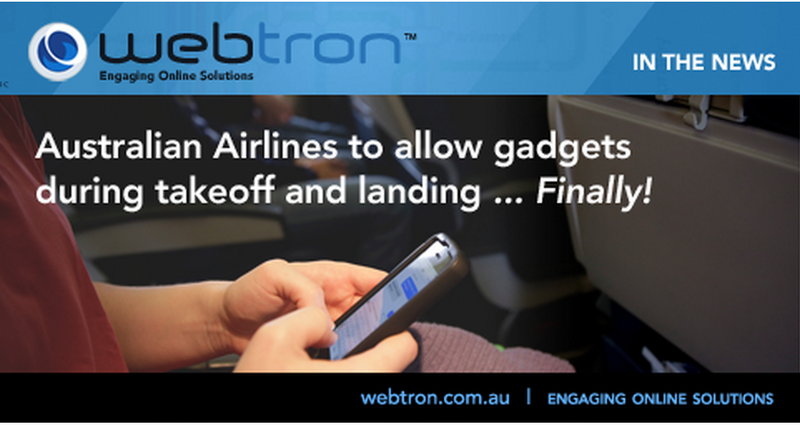 Virgin Australia are set to be the first cab off the rank to allow inflight gadgets during take-off and landing. This is after they applied for approvals for devices to be used in all phases of flight. And a decision could be reached as early as Monday. Virgin has offered streaming of in-flight entertainment which can be accessed via WiFi. Previously it was only during level flight that the service could be used. On short trips, such as between Sydney and Canberra, that could have meant as little as 15 minutes of streaming time. Will Qantas be next to follow? Qantas Airways has already announced plans to put a similar streaming entertainment system in place on its A330 aircraft and some of its 737s and had lodged an application with CASA. An implementation date wasn’t given for inflight gadgets, however. Large PEDs (such as full-size laptop computers) must be stowed in an approved carry-on stowage location. They must not present an undue hazard in the event of severe turbulence, crash forces or emergency egress. Small PEDs must be stowed or secured at all times when seat belts are required to be worn. Passengers who do not wish to stow their PEDs should be encouraged to secure them on their person. Passengers may also secure small PEDs by placing them in seat pockets or holding them in their hands. A PED should not be left unsecured on an empty seat.